Along with the poor economic growth in Eurozone, the Brexit deal is weighing on EUR. 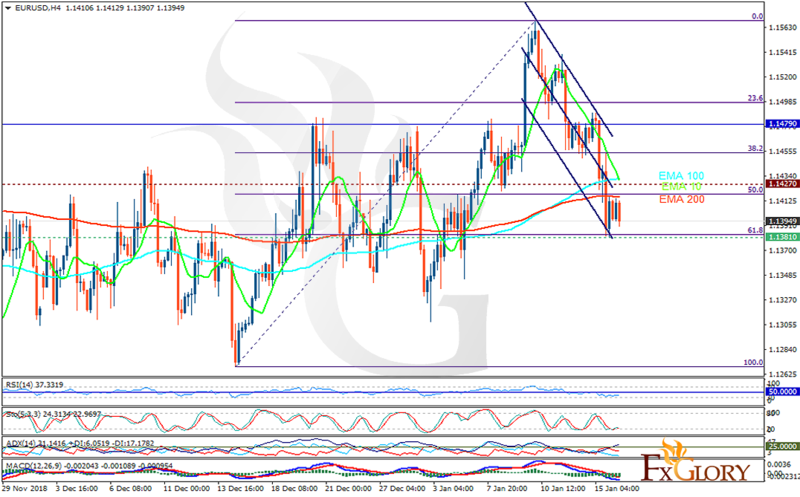 The support rests at 1.13810 with resistance at 1.14270 which both lines are below the weekly pivot point at 1.14790. The EMA of 10 is moving with bearish bias in the descendant channel and it has reached the EMA 100; they are both above the EMA of 200. The RSI is moving below the 50 level and the Stochastic is moving in low ranges. The MACD line is below the signal line in the negative territory. The ADX is showing sell signal. The price has already reached 61.8 level of Fibonacci therefore it might be time for the bulls to form the correction pattern. While considering pullbacks, buyers can target 1.145.